The herding class is a fascinating group of dogs, many of which have now become very popular pets. We are seeing more and more Australian Cattle dogs and Australian Shepherds at our doggie daycare as people are welcoming these amazing animals into their families. And they make excellent pets… they are loyal, attentive, easy to train, friendly and outgoing. But ownership of any dog in the herding group is not for the couch potato lifestyle, as these dogs require a much greater amount of physical and mental stimulation than most other breeds. In addition to the Australian Cattle dog and the Australian Shepherds, the Border Collie, German Shepherd, and the Corgi are also very popular pets belonging to the Herding group. There are many others, but these are probably the most well-known. Many people chose dogs from the herding group based simply on appearance and congeniality, but often they know very little about what makes them tick. 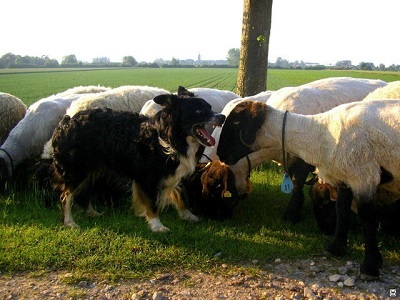 Do you have what it takes to own a herding dog? I was at an outdoor event the other day and was watching a man with an Australian Shepherd navigate through the crowd. The dog was visibly anxious and distressed. He was pulling to the right and left…doing a little yelp/whimper thing, wide-eyed and nervous. I could tell the owner was good to the dog, but the dog was obviously struggling with some issues that his owner was oblivious to. This well-intentioned owner probably has no idea that he is most likely the cause of his dog’s somewhat neurotic behavior. Unfortunately, too many herding dogs are limited to being “just a pet” and are grappling with anxiety-related issues spurred by owners who know little about their needs and requirements. I personally would love to have a super-smart Border Collie, but I know I do not have the kind of lifestyle that this magnificent dog would need. A Border Collie, as well as all others in the herding group, do best in a home with lots of activity and energy and are great for families who enjoy exercise and outdoor activities. They need owners who are committed to doing more than just taking them on a walk around the neighborhood. “Normal” walks and a backyard to play in is really not enough… unless you intend to walk 5 miles twice a day and play games with him in the yard for an hour each day! If you’re looking for a low-maintenance dog, look elsewhere. These pups need highly-involved owners. A herding dog has a tremendous need to “work”. They will become restless if they do not have a job to do. They are high energy, very athletic and like to stay busy. Their herding instinct must be appeased in some way, but not necessarily by actual herding activity. They just need some kind of mental and physical outlet. To assure your herding dog lives a happy and “balanced” life, he needs consistent exercise and mental stimulation. Mental stimulation can come in many forms. I think organized doggie sports is the best type of stimulation because it is not only good for their mind, but also provides great socialization and physical exercise. Doggie sports demand mental discipline and focus, and the herding breed just eats that up! Some activities you might consider are agility, competitive obedience, flyball, canine aquatics competitions (dock dogs), and frisbee trials. You may even think about involving your pup in police work or search and rescue… Anything that gives them a chance to use their intellect. These dogs can be nippers (or even biters), as nipping is a way to control the movement of cattle when they are herding. They may begin nipping at your heels even as very young pups. Herders may come up behind you and poke you with their nose to try to get you to move or do what they want you to do, just like they would to make an animal move when they’re herding. They’re very demanding. I know, poking is kind-of funny, especially when it takes you by surprise. It’s also a very tough behavior to stop. Chasing is also a very innate habit of these dogs, which can cause all kinds of trouble if not corrected. They may chase your kids, or your cats, or maybe kids running or biking down the street. They may even chase cars, which can be very dangerous for them. Circling is not necessarily “bad”, but it can be annoying. This is when your dog is making circles around you while you’re trying to walk. Circling could cause tripping though, especially to an elderly person. Lastly, many herders bark while “herding”. Barking can become a habit even when he is not herding. Excessive barking is never a good thing. You will need to work with a dog trainer to manage your herding dog’s barking. A side thought…I often wonder about Queen Elizabeth and her little pack of Corgis. I’m sure those little darlings are not content walking slowly alongside their master and just hanging out in the castle every day! I read once many years back that the Corgi requires more exercise than any other breed, although I’m sure it was referring to the herding group as a whole. The Queen must have a handler on staff who takes the dogs out for exercise. But, hey, did you know that that Queen Elizabeth is a hands-on, very adept dog trainer? It’s true! I urge you to consider the long-term commitment you must have before you bring a herding dog into your home. If you do, please know that our Professional Dog Trainers are here to help. It is imperative that you work with a Trainer as early as possible as it will eliminate some behaviors from becoming habitual and persistent. With the right training and leadership, your herding dog can be the very best dog you’ll ever own. Error: Error validating access token: Session has expired on Monday, 29-Oct-18 09:08:51 PDT. The current time is Thursday, 18-Apr-19 19:26:51 PDT.